NASR-ED-DIN HODJA was striding through the streets, one hand firmly grasping the roast goose tucked under his arm, the other hand pinching his own nose tight shut. He could not trust himself to let the fragrance of the roast goose tempt him. The goose was a present for Tamerlane and must arrive without nibbles breaking its crunchy goodness. A fly lighted on the Hodja's forehead. He took his hand from his nose just long enough to brush the fly away, but even that moment was too long. The spicy aroma of the roast goose sank deep into his nostrils. He remembered what a long time it was since he drank his morning cup of coffee; how much Ionger it had been since he last tasted good roast goose, After all, there was plenty to eat in the palace. Tamerlane would never miss a little portion of the goose, a plump crisp leg for instance. Nasr-ed-Din Hodja walked on toward Tamerlane's palace, nibbling a leg of the roast goose. As he walked through the palace yard, he could not help wondering what Tamerlane would think of a roast goose with but one leg. Never mind! He would worry about that when the time came. The good leg he had eaten was worth any trouble that might come because it was gone. Nasr-ed-Din Hodja found Tamerlane quite by himself and glad of company. The great ruler seemed as thankful for the succulent goose as though his huge pantry shelves were empty. He turned the goose over and over the better to admire its rich fatness. "What a cook your Fatima is!" exclaimed Tamerlane. "No one in my kitchen can roast a goose to such perfection!" "Yes, Fatima is a fine cook," agreed the Hodja. He chattered on as fast as he could about Fatima's pilafs, Fatima's soups, Fatima's dolmas, Fatima's baklava. If he talked fast enough, the absence of the leg might not be noticed. "Hm-m-m-m! This is strange - very strange!" Tamerlane was looking at the legless side of the goose. "This goose has only one leg!" "To be sure!" The Hodja looked out of the window, playing for time to think what to say. "To be sure! How many legs would you expect?" "Two legs?" The Hodja laughed, his eyes alight at something he had seen through the open window. "Not at Ak Shehir. Geese in other towns may have two legs, or three, or four for all I know, but the geese of Ak Shehir are famous for being one-legged." "How can you lie to me like that?" Tamerlane jumped to his feet, his good-natured mood as gone as the goose's leg. "You know as well as I do what happened to that other leg. One-legged geese of Ak Shehir, indeed!" "Well, if you won't take my word for it, look with your own eyes." Nasr-ed-Din Hodja pointed Out of the window. "There is a flock of Ak Shehir's famous one-legged geese by your own fountain." Tamerlane looked where the Hodja pointed. By the fountain - could he believe it? - he saw a dozen big white geese sleeping in the sun, each goose supporting itself steadily on one slim yellow leg. "How many legs do you see?" asked the Hodja. "I count twelve geese and twelve legs. Can you count any more than twelve?" Tamerlane stared and clicked his tongue. "No." Funny he had never noticed before. What with waging wars and setting up a new government, he had been far too busy to notice geese. "The geese of my boyhood village in Asia had two legs apiece, I am sure." Tamerlane's voice was apologetic. "That's perfectly possible," agreed the Hodja kindly. "But this is not your boyhood village. This is Ak Shehir, the home of one legged geese. "I've been too busy to notice such things, murmured Tamerlane. "Well, I must be going," said the Hodja with an anxious glance at the sleeping geese. "Selamun aleykum!" "Ve aleykum -" began Tamerlane, but he never finished his farewell. Just at that moment, a camel that had been sleeping beside the fountain stretched itself and squealed with all the power of its long, strong neck. Its voice ran up and down the scale, shrilling and screaming. It echoed and re-echoed in the walled courtyard. With a hiss, the twelve geese woke from their sleep. With a louder hiss, each stretched out the leg that had been tucked under its wing. With a great flapping and hissing, the twelve geese scattered, each goose running on two perfectly good legs. By the time Tamerlane came to his senses, Nasr-ed-Din Hodja was down in the courtyard below his window. 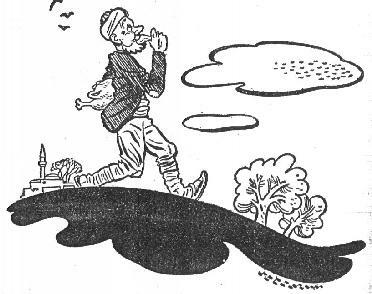 Quite forgetting his dignity, Tamerlane stuck his royal head out of the window. He called after the Hodja something that sounded more like the hiss of a goose mixed with the squeal of a camel than it sounded like the words of a great conqueror who had just accepted a gift from a loyal subject. But the Hodja was ready with his answer. "My good Tamerlane," called the Hodja just before the palace gate opened for him, "if you or I had such a racket poured into our ears when we were asleep, we would each sprout at least four legs!" And Tamerlane, in spite of himself, smiled as he pulled off the remaining leg of the goose and sank his teeth in its tenderness.